As a grown up survivor of infant stomach sleeping and that rolly jumper thing that's now illegal in Canada, I think it's important to be an informed and engaged parent, whatever that may look like for you. I got a kick out of Katie's straightforward commentary in the ever shifting world of "what is best for baby" and whether you agree or disagree with her points, I hope it gives you some food for thought and a reminder that we're all doing the best we can with what we know. Meet Katie. Katie's a wife and mom with a self proclaimed PhD. in Googling. Her writing has been featured in The Mighty, Redbook, Good Housekeeping, Scary Mommy, Yahoo! Parenting and The Huffington Post. 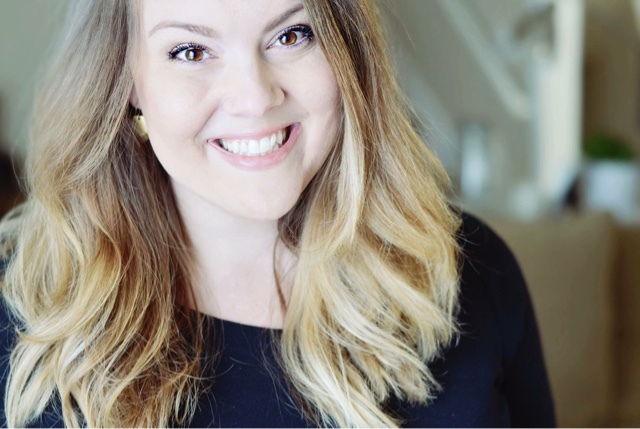 Her blog, Twelve and Six deals with the messy combination of elation, frustration, humor and compromise that being a mom and wife embodies. You can also find Katie on Instagram, Facebook and Twitter. I first met Katie through Instagram when I realized our babies were just about exactly the same age and that we'd both been posting exactly the same hilarious memes. Katie has a gentle and kind manner but is tough as nails and full of sarcasm, in other words, a fierce friend (just how I like 'em). This post was originally published on Twelve and Six. Someone posed this “fill-in-the-blank” in one of my mom groups on Facebook the other day and the responses were too good not to share. Maybe they aren’t lies for EVERYONE, but they definitely aren’t the truth for everyone. Dear first timers: take heed. Here were the most popular votes + my two cents. There is no bigger lie told to mothers than _____. This is such a common misconception and it sets mothers up to feel like psychopaths when they don’t immediately start bawling and fall passionately in love with this slimy stranger. Bonds aren’t always instant and that is totally normal. Nope! Breastfeeding DOES burn a ton of calories, but your body also stores fat while you are breastfeeding. Some women have higher metabolisms and they may drop weight fast, but this is not a universal norm. Don’t even have weight loss expectations and you won’t be disappointed. As precious as this sounds, I will have to disagree. Sometimes, yes, I slept when they slept. If I am literally too exhausted to safely take care of kids, then yes, I will sleep a little. HOWEVER. Most women have a lot of other things to deal with. This one also reminds me of “let the house go”. I can’t just totally let my house go. No one is happy with a cluttered, messy house, especially me. Sleep if you can, but don’t feel bad about getting stuff done during their naps. This one is a big deal for me. My first child was the easiest baby in the world. He was super low maintenance. With my last one, I kept waiting on these magical ages where the wise mothers had told me everything would magically improve. “Oh you will have a routine down after three weeks.” Um. No. I am still trying to get a routine down and I am six months postpartum. Ignore all that. Another myth that sets us up for failure. Motherhood doesn’t come natural to everyone. Actually, I am willing to bet that it doesn’t come natural for the majority of us. Just because we have a uterus doesn’t mean we are programmed to be a mommy autobot. (I think I just made that word up, but I like it.) Maternal instincts are different for everyone. Motherhood is unlike any other feeling in the world, yes, but different strokes for different folks, ya know? Nope. Nothing in parenting is “one size fits all.” What worked for my babies may not work for yours. What worked for one of my babies might not work for the other. Accept advice with grace and live by trial and error. Don’t panic if someone gave you some bible truth that isn’t working for your kid. Get. Out. Of. Here. With. That. Noise. My pregnancies were horrible. Both of them were, for different reasons. I understand that there are unicorn moms who had flawless, glowing pregnancies but many moms hate pregnancy and I am one of them. It doesn’t make me less of a mother or a woman. It also doesn’t stop me from making babies. It just is what it is. I had to add this one because I see this posted all over social media and mamas are not fact checking and depriving themselves of caffeine and the occasional night cap. In fact, I mentioned drinking wine in an old post of mine here, and when republished by The Huffington Post- was virtually shamed for even thinking of such a thing. Allow me to share factual information with you. Alcohol in moderation is 100% ok while breastfeeding. Very little crosses into your breastmilk and there is no need to pump and dump. Alcohol metabolizes and leaves your milk the same way the blood alcohol content decreases over time. There are a ton of credible resources to support this. About caffeine… listen…. don’t take my coffee away. There is no evidence to suggest that caffeine is harmful to a breastfeeding baby and I have about a thousand moms that will back me up with their own experiences. They are caffeinated. And ready to back me up. Because coffee jitters. I saved this one for last because it’s the most important to me. A healthy baby is wonderful. A healthy baby is a beautiful gift from God. HOWEVER. A healthy baby is most certainly not all that matters. YOU matter too. A healthy mama is just as if not more important. If your cup is empty you can’t give to anyone else. Make sure you are accepting help if you need it, carving out time for self-care, and giving yourself a break. Transversely, if you happen to give birth to a baby that isn’t “healthy”, you still matter. You’re baby still matters. You’re still a mom. Bottom line: don’t hold yourself to anybody else’s standard. 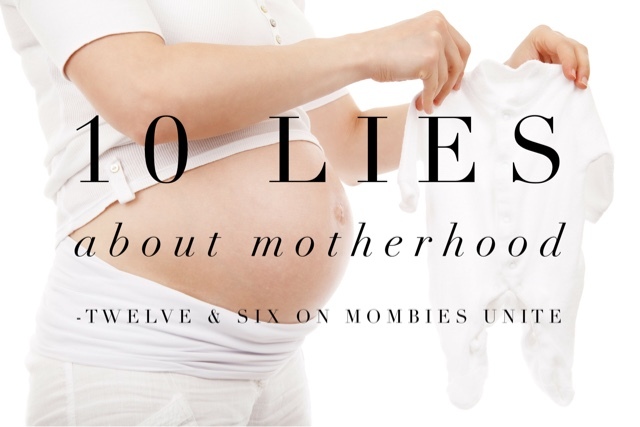 What's the biggest lie you've discovered about motherhood? Twelve and Six and on Instagram, Facebook and Twitter!